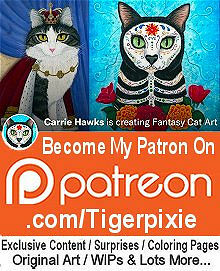 Subscribe to be one of the first to know about my newest artworks, products, upcoming appearances, sales, unique special offers only for members and lots more about my whimsical fantasy cats! Stone Balanced Lion - Bookmark - AKA "Two Of Earth" for the 78 Tarot Elemental Deck. Two Of Pentacles is an Earth card, So I wanted to include lots of..
Christmas Kitten Boy - Bookmark - An adorable snow white kitten peeking out of a festively wrapped holiday gift. He is sitting by a twinkling Christma..
Voodoo Empress Fairy Cat Doll - Bookmark - A creepy cute patchwork Voodoo Empress Fairy Cat Doll with a little pin stuck in her. She's as happy as can..
Lil Mummy Kitten - Bookmark - An adorable wide eyed grey kitty dressed as an Egyptian Bast Mummy for Halloween. He is on a spooky forest trail and has..
Senorita Cat - Bookmark -A beautiful white cat wearing a colorful floral crown of marigolds, roses and daisies. She is dressed in a multicolored embro..
Walter The Artist - Bookmark - Walter is quite the Artist! Behind him is his colorfully painted canvas with streaks, splatters, paw prints, and ..
Bakeneko Nekomata - Bookmark - AKA The "Ace of Wands" for the 78 Tarot Mythical Deck. A positive card full of personal power and hope for the fu..
Day of the Dead Cat Moon - Bookmark - Día de los Muertos Gato, A stylized moon cat for the Mexican holiday Day of the Dead. A bright full moon surroun..
Day of the Dead Cat Princess - Bookmark - Día de los Muertos Gato, A beautiful princess cat wearing an ancient Aztec Tiara of silver and turquoise. Sh..
Alien Cat - Bookmark - AKA The "Page of Wands" for the 78 Tarot Astral Deck. The Page of Wands is a fire card representing exploration, discovery, ent..
Day of the Dead Cat Sunflowers - Bookmark - Día de los Muertos Gato, A handsome blue eyed cat painted as a sugar skull cat, framed by colorful marigol..
Halloween Black Kitty - Bookmark - An adorable wide eyed black kitty peeks over the top of a glowing cat faced Jack O Lantern. I love Halloween! It's ..
Day of the Dead Cat Candles - Bookmark - Día de los Muertos Gato, A gorgeous black and white cat wearing an ancient Aztec necklace of silver and turqu..
Voodoo Cat Doll - Bookmark - A creepy cute patchwork Voodoo Cat Doll with three little pins stuck in her. She's still as happy as can be with her stit..
Little Purple Horns - Bookmark - A cute big eyed kitten with little purple horns all dressed up for the 1980s with a big purple bow and plastic charm ..
Madame Zoe Teller of Fortunes - Bookmark - AKA The "Queen of Cups" for the 78 Tarot Carnival Deck. The Queen of Cups is a card that represents c..
Day of the Dead Cat Skull - Bookmark - Día de los Muertos Gato, A striking black and white illustration of a black cat painted as a sugar skull cat, f..
Dorian Gray - Bookmark - My own cat version of Oscar Wilde's handsome, narcissistic, immortal, Dorian Gray. He's in the attic standing in the candleli..
Cheshire Cat - Bookmark - My version of the Cheshire Cat from Lewis Carroll's Alice's Adventures in Wonderland. He has his classic Cheshire Cat Grin i..